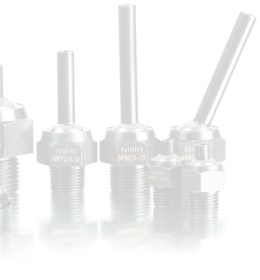 Our Point Fixed Point Nozzles are designed to direct the coolant at any target you aim at. Coolant flow volume is consistant at maximum nozzle angle. Ensuring a stable and accurate stream for cutting and grinding. Contributing to working stability , working efficiency, and longer tool life which will help keep your tooling cost down. • It never misses target once nozzles tip is set. • Metallic body is high pressure resistant. • Both national pipe(NPT) and Metric(mm) thread available. • Maximum angle adjustment is ±35°.